Results from today’s Solo & Ensemble Competition are now available. The BBL would like to say congratulations to all of today’s prize winners and a huge thanks to all of our competitors for a fine day of music making. There has also been a selection of music and books left behind. If anyone wants to claim them please get in touch. 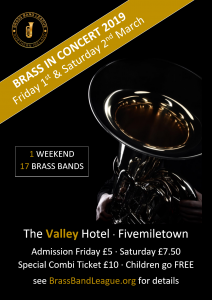 The BBL are delighted to annouce the line-up for next month’s Brass in Concert weekend which will take place at The Valley Hotel, Fivemiletown from Friday 1st to Saturday 2nd March. Timings for our upcoming Solo & Ensemble competition are now available for download from our website. The Junior Section draw is also available for download. Due to closed adjudication, the Senior Section draw cannot be published online, however it will be emailed to the secretary of each back whose members are taking part. A copy of the draw may also be requested by contacting us directly. Saturday 24th November saw 16 bands descend on Belfast’s Whitla Hall as guests of The School of Arts, English & Languages at Queen’s University Belfast. 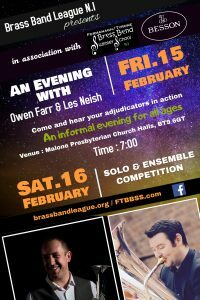 The BBL were delighted to see entries extend to include bands from both Republic of Ireland (Navan Silver) and Scotland (Lochgelly Band). The day got off to a cracking start with 5th grade band 1st Larne Old Boys under conductor Bill Clements taking to the stage with a highly entertaining programme which covered all the bases. The band’s William Hollinger was awarded the soloist prize for his lovely rendition of “Con Te Partiro” and the band also took the March Prize for Festival March. The 3rd grade saw a closely fought contest with prizes distributed across all bands in the section. Davi Johnson of Dynamic Brass took the soloist prize for “Georgia On My Mind”, Dungannon Silver walked away with the prize for Most Entertaining Band but it was returning champions Wellington Memorial Silver under conductor David Hawthorne who reclaimed the title and also took the march prize for Imperial Echoes. Moving on the 2nd grade, Andrew Gordon’s gorgeous performance of “Gabriel’s Oboe” saw him take the soloist prize for Roughan Silver but it was Ballyduff Silver under Willie Hill who gathered up the rest of the prizes, winning best march for “On the Quarter Deck”, most entertaining band and the section prize. Youth Bands were up next. 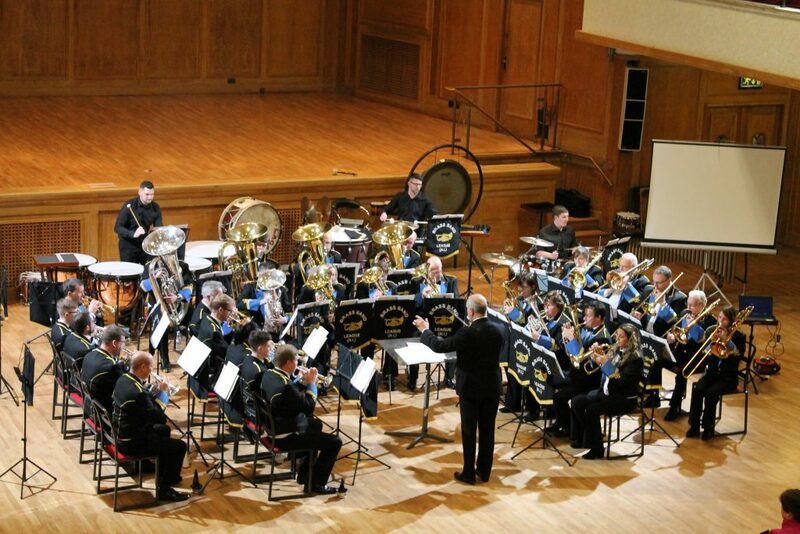 Despite an up-tempo audience-pleasing programme from Downshire Brass Youth Band, long-time champions 1st Old Boys Youth Band led by Jacklin Bingham once again reclaimed the title with a clean sweep. Louise Bell’s stunning rendition of “First Light” secured her the soloist prize, the band’s tight performance of “Holyrood” took the march prize and they also took the prize for most entertaining band. After a short break to allow adjudicators and audience alike to take a breather, the Championship section saw 5 bands go head-to-head. 1st Old Boys under the direction of Stephen Cairns took the prize for Most Entertaining Band, but it was to be Laganvale’s night with new conductor Keith Anderson leading the band to claim the top prize of the day, with the band also taking the march prize for “New Colonial” and Sop player Mark Ruddock the soloist prize for his rendition of Stephen Crooks’ “Legacy”. All in all, a fine day of music making. The BBL would like to thank Dr David Bird, Professor Michael Alcorn and the team at Queen’s University for their huge efforts both behind the scenes and on the day which helped the event run so smoothly. A huge thanks also to our competing bands for providing such an entertaining array of programmes. 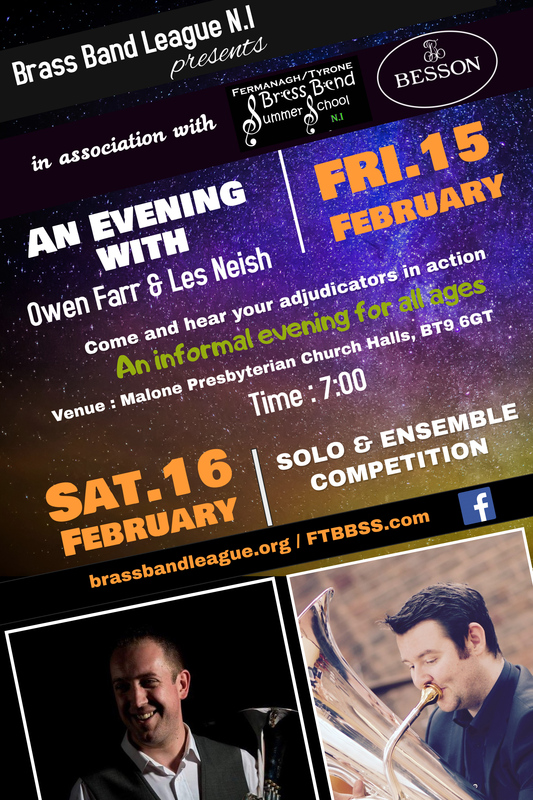 The Brass Band League are excited to announce the line-up for our forthcoming Festival of Brass. 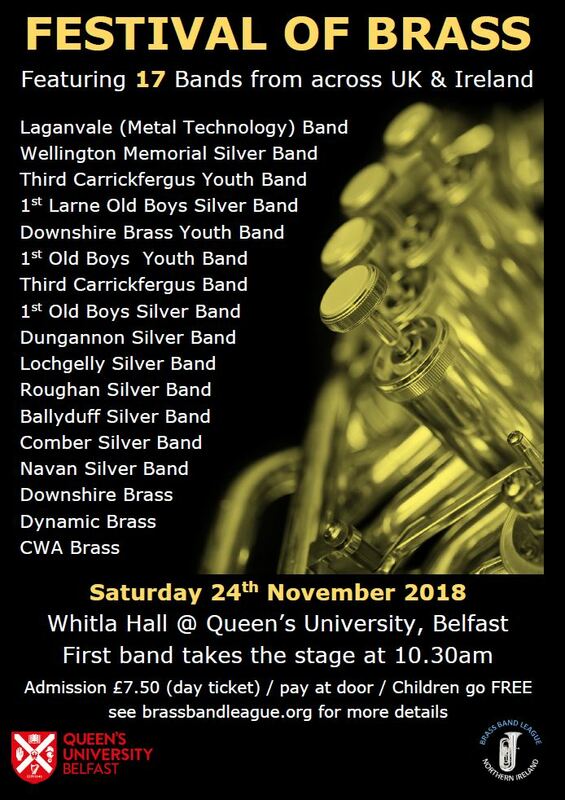 In association with Queen’s University, Belfast we will present performances of 17 brass bands from across UK & Ireland on Saturday 24th November. Each band will perform a mini-concert programme varying from 15-25 minutes with a panel of judges assessing each band’s performance on its musical and entertainment qualities. Our first band will take to the stage at 10.30am. 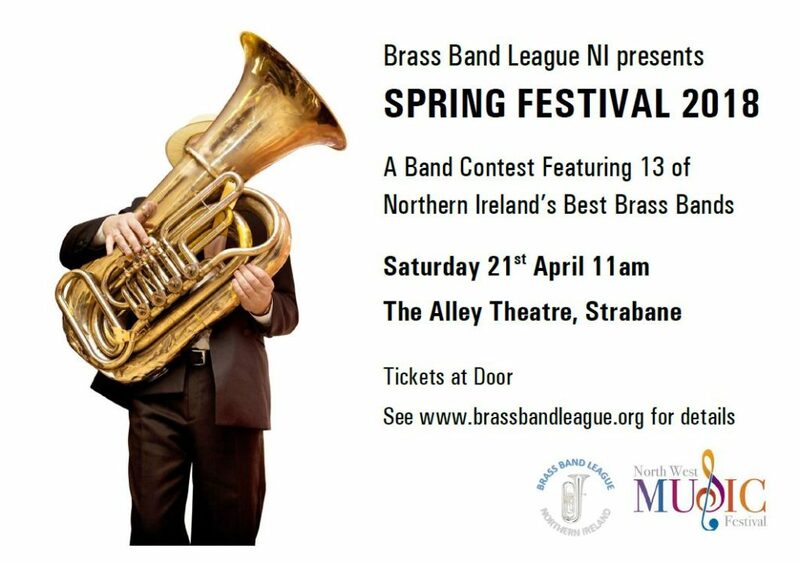 The BBL look forward to returning to The Alley Theatre, County Tyrone on 21st April to present our annual Spring Festival Band Contest as guests of The North West Music Festival. 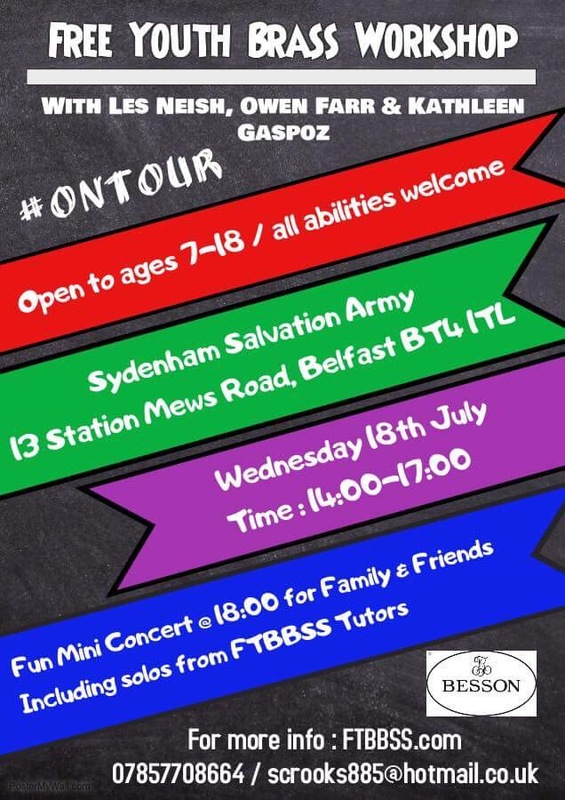 13 bands from across Northern Ireland will travel to sunny Strabane to compete on the day with each performing a major work of their choice. 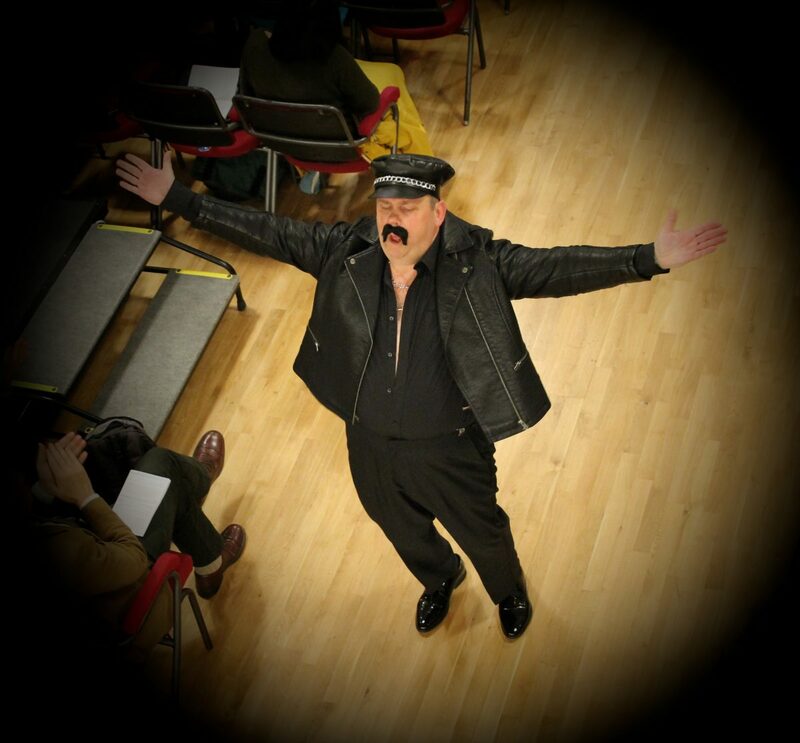 Renowned adjudicator Ian Brownbill will judge the performances and decide who will take home the vast array of trophies. Our first band will be onstage at 11am with each performance lasting approximately 15-20 minutes. This promises to be a fine day of music making. Tickets are available from the theatre box office. 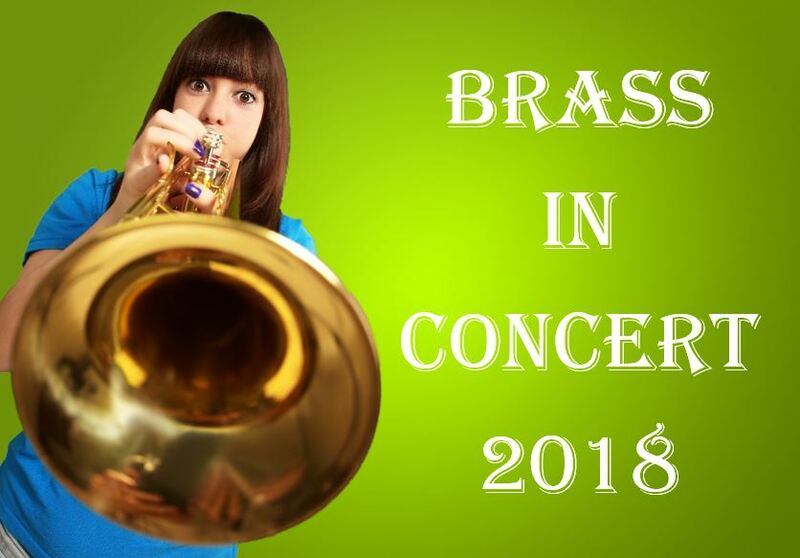 20 bands took part over two days in the recent BBLNI ‘Brass in Concert’ Championships in Fivemiletown, N. Ireland. Held at the excellent Valley Hotel, the event has expanded in recent years to include a Friday night concert featuring local, non-contesting bands. 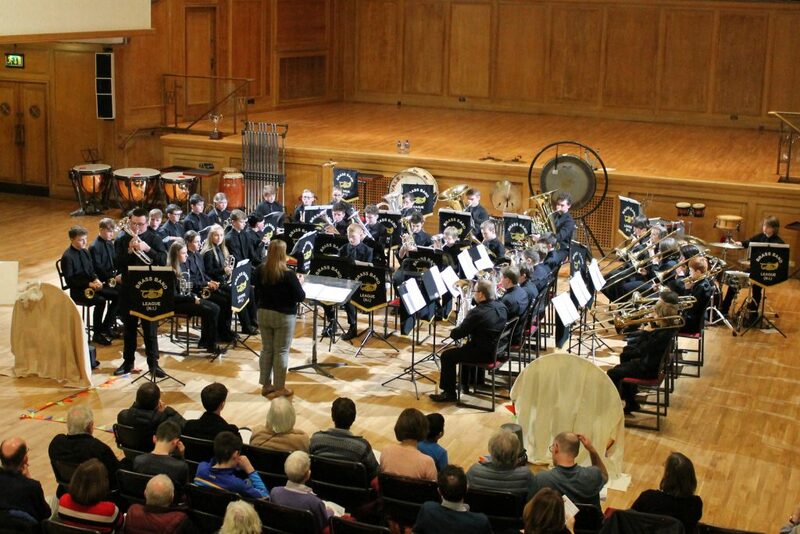 This year saw seven bands play to a large audience – including, for the first time, two local school bands from Omagh Academy and Enniskillen Grammar. Saturday, the main contest day, got off to a great start with some excellent performances in the Fourth Section. Despite the early start, there was a large audience to see Poyntzpass secure victory along with the ‘Most Entertaining Band’ award. Wellington Memorial once again secured a clean sweep in the Third Section, continuing their excellent run of contesting performances over the last 2 years under the baton of Gary Proctor. 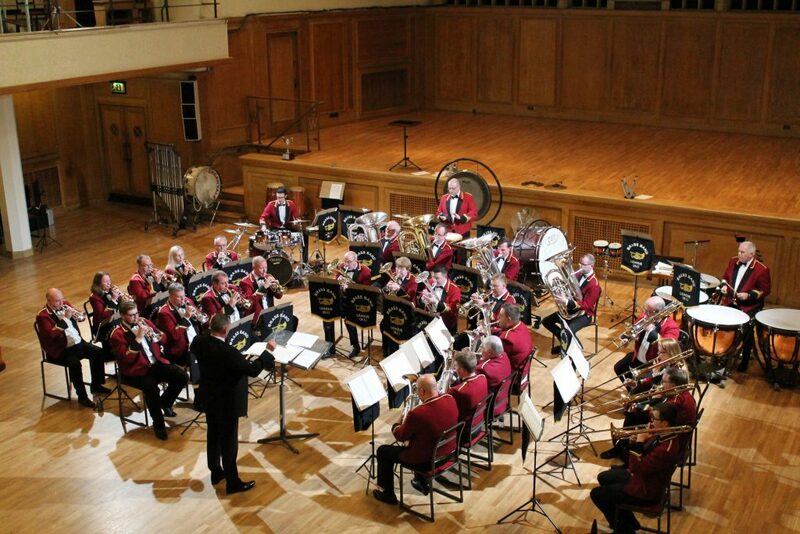 They claimed ‘Most Entertaining Band’, the ‘Best March’ prize with their rendition of ‘Glorious Victory’ and the ‘Best Soloist’ prize with Graham McNamara’s horn solo ‘Goodbye to Love’. 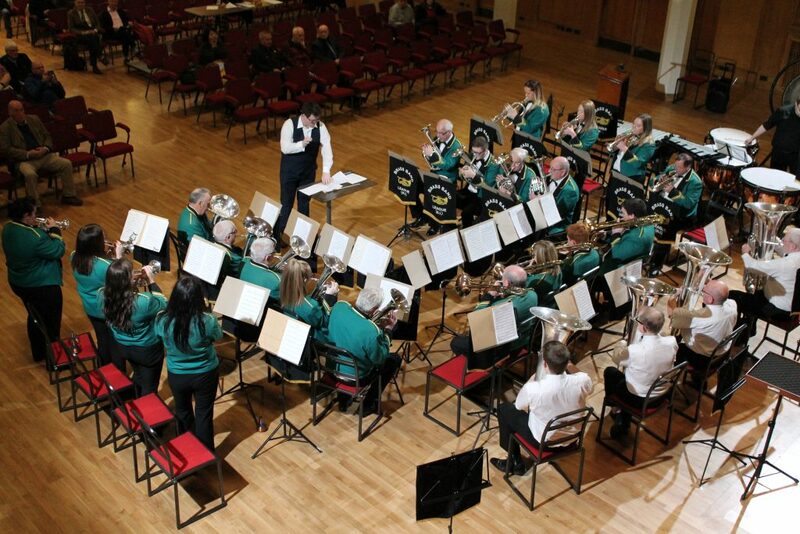 A tightly fought Second Section saw defending champion Roughan reclaim their title under new conductor Stephen Crooks. They secured first place in both music and entertainment, took the ‘Best March’ prize with ‘The Cornish Cavalier’ and principal cornet, Andrew Gordon won best soloist. The day was rounded off by a cracking top section battle which really impressed adjudicators Alan Morrison and Frank Sweeney. 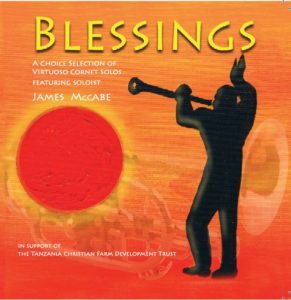 A moving rendition of the soprano cornet solo ‘On With the Motley’ gave Murley’s James Cooke his third ‘Best Soloist’ prize at this event in the last 4 years. 1st Old Boys took the best March Prize with ‘The Champions’, but it was Laganvale (Metal Technology) who took first prize overall, giving their conductor Stephen Crooks a personal double at the event. To cap things off, Laganvale were also adjudged the ‘Most Entertaining Band’ with their themed programme ‘Darkness into Light’ featuring music by Peter Graham, Ben Hollings and local composer, Brendan Breslin. 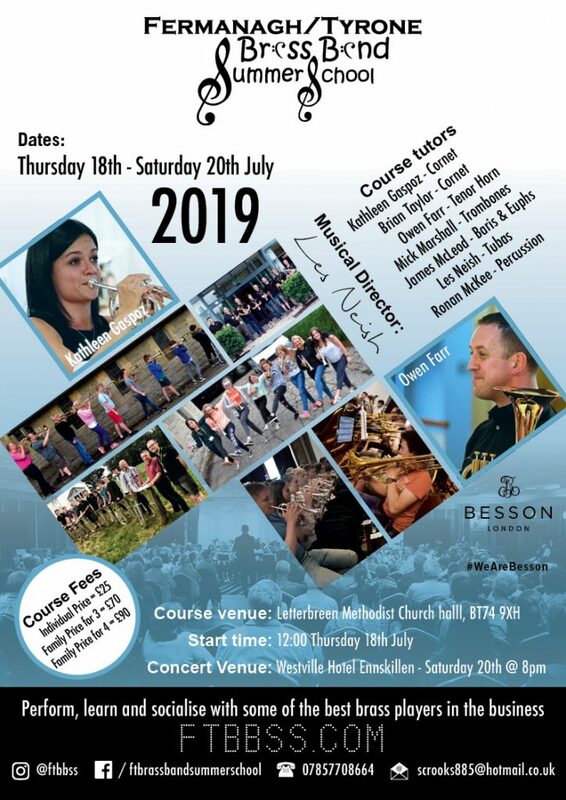 An event spokesperson told 4BR: “The Brass Band League NI would like to congratulate all the prize-winners, and all competing bands for a fantastic day of music making and entertainment. Adjudicator Alan Morrison noted how the standard of both playing and entertainment programming had improved massively across all sections since he last adjudicated in N. Ireland some 9 years ago. 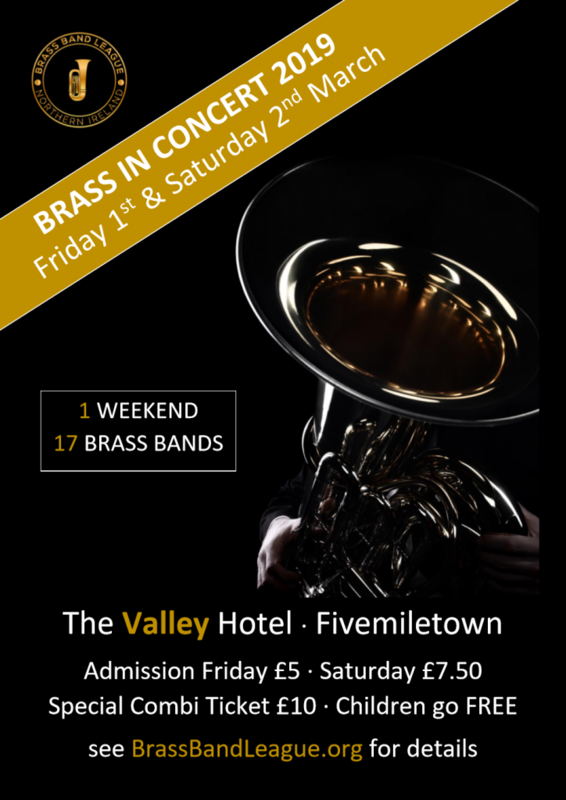 The Brass Band League are delighted to announce the line-up for our upcoming Brass in Concert weekend in the Valley Hotel, Fivemiletown. 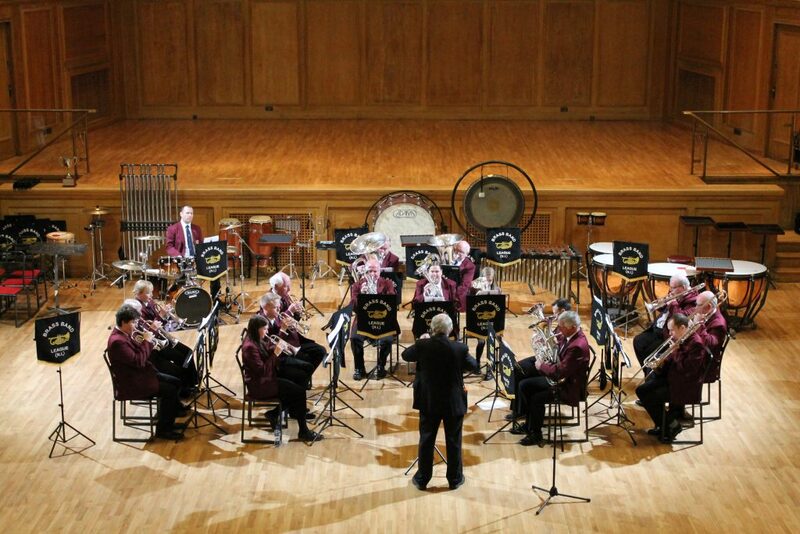 Over the course of the weekend we will feature 20 performances from some of Northern Ireland’s best brass bands. Both events are pay at door.